Hoof Knife Loop Dusky Forge - $0.00 : Hawkesbury Toolworx - Tools, Farrier Supplies & Outdoors - Specials- For an extensive range of tools for all types of tradesmen and all your farrier, hunting and ammunition or outdoor supplies. 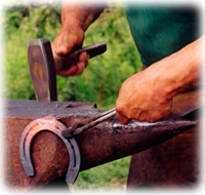 We have a comprehensive range of different sized loop knives they have been appreciated by farriers and veterinarians from all over the world. 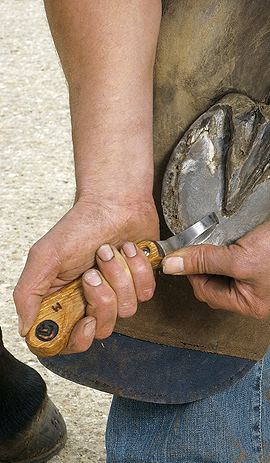 Each knife, and ergonomically designed handle, is hand crafted with all blades being constantly reviewed in order to produce a better working knife. Knife blades are now fully welded at the base of the blade, making them stronger and more hygienic. The combination of shape, sharpness and fit - eases a lot of strain and stress and ensures they remain a popular choice. The high quality steel and unique methods of tempering ensure that these knives keep their edge longer than most other knives on the market.